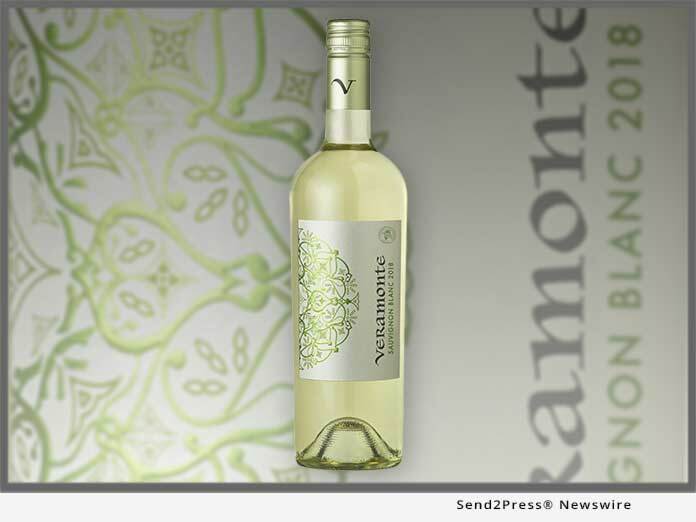 CASABLANCA VALLEY, Chile, Feb 12, 2019 (SEND2PRESS NEWSWIRE) -- Gonzalez Byass has announced the very first ECOCERT(R) certified organic wine for its Casablanca Valley, Chile-based Vinedos Veramonte: the 2018 Sauvignon Blanc (SRP $11.99). Veramonte is the standard bearer within the Gonzalez Byass umbrella of Chilean labels (which also include Ritual, Primus and Neyen), and this release marks the first of what will eventually become a 100 percent organic/biodynamic stable of all its Chilean wines. The 2018 Sauvignon Blanc was certified by ECOCERT(R), the France-based inspection and certification body that is considered the benchmark in organic certification worldwide. Considered the definitive expert and pioneer in organic food certifications, ECOCERT(R) is an independent body recognized by international public authorities. They offer worldwide inspection and certification services according to public regulations or private standards. In 2018, winemaker Sofía Araya took over as Head Winemaker, receiving the reins from her renowned predecessor and mentor Rodrigo Soto. Together they spent six years integrating the organic methods which would eventually lead to this important certification, and will eventually convert Gonzalez Byass' vast vineyard holdings in the Casablanca, Colchagua and Apalta Valleys to 100 percent organic and biodynamic - a project of ambitious scale. So far 500 hectares of vineyards have been certified organic, and 2020 will mark the first Veramonte vintage that will also include Demeter's Biodynamic Certification across all vineyards. In Chile, there are roughly 5,000 hectares planted with organic grapes, which means approximately 10 percent of organic grapes in Chile are currently from Vinedos Veramonte. At Veramonte, quality compost application was implemented to increase soil biodiversity, using stems and pomace collected during harvest season. Cover cropping in between vineyard rows improved soil structure, reduced erosion and added key nutrients for vines. Animal husbandry was introduced in the form of a flock of sheep, in order to help with minimal impact grass mowing (as well as to obtain healthy manure). Vast habitat breaks have always been an essential component in Veramonte's unique terroir, as they provide a critically self-regulated ecosystem, eliminating need for herbicides of any kind. Native yeast fermentations and minimal intervention facilitate naturally made wine from vine to bottle, resulting in the most complex expression of the vineyards' diverse terroirs. With its decomposed granitic soils and ample biodiversity, Casablanca Valley is one of the wine regions best suited for quality organic wine. Certified organic has been one of the fastest growing Chilean wine categories in recent years, and with the ECOCERT(R) certification, Veramonte is single-handedly changing perceptions of how such ethical wines can be produced accessibly for a wider audience. Gonzalez Byass is a family-owned collection of wineries founded in 1835 which spans across Spain's most important wine producing regions. From its foundation, the Gonzalez family have been dedicated to making fine Sherries and brandies in Jerez, Spain, creating such well-known brands as Tío Pepe Fino Sherry and Lepanto Brandy de Jerez. Today the fifth generation of the family are the custodians of these exceptional brands having built the company into a family of wineries which produces wine in some of Spain's most famous regions; Bodegas Beronia (Rioja and Rueda), Cavas Vilarnau (Barcelona), Finca Constancia (Vino de la Tierra de Castilla), Finca Moncloa (Vino de la Tierra de Cadiz), Vinas del Vero (Somontano) and Pazo de Lusco (Rías Baixas). In each of these regions the family strives to make the best possible quality wines respecting the local terroir and the environment. Gonzalez Byass is now one of Spain's most well-recognized brand owners world-wide. Their passion for quality wine production and respect for long-standing traditions, whilst at the same time innovating, have been the guiding principles that have led to the company's global success. In 2018, they were recognized by the Wine Star Awards as the Best European Winery of the Year at the annual gala held in Miami, Florida. Learn more at https://www.gonzalezbyass.com/en/ -- and http://www.veramonte.cl/en/ .